Welcome to Week #6 of our Fiber Arts Fiction Friday (FAFF) series! 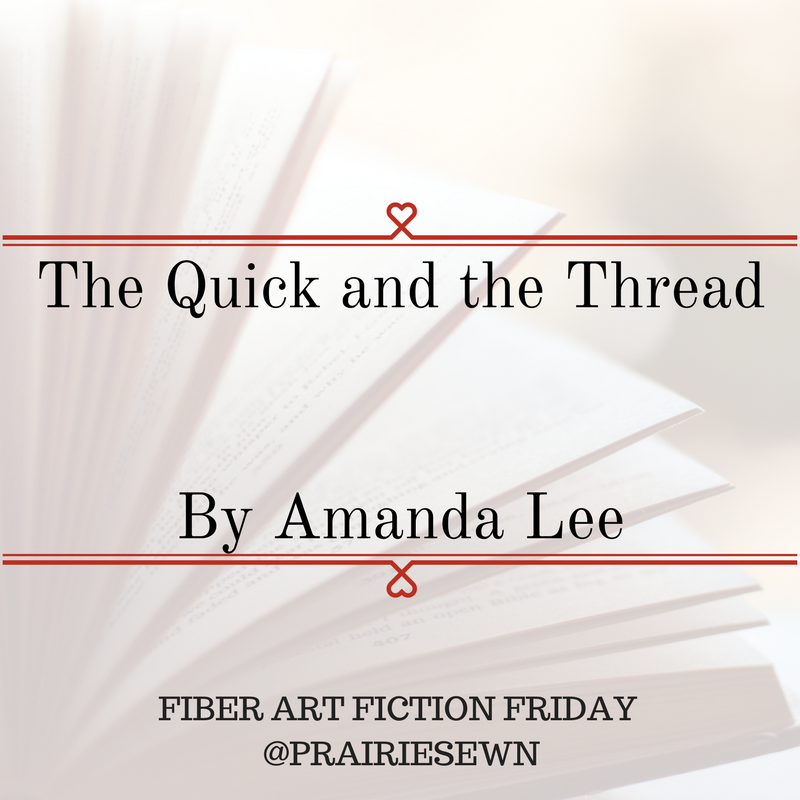 I’m super excited to introduce a series and an author that was brand new to me: Amanda Lee and her Embroidery Mystery Series, starting with the first book The Quick and The Thread. As the first book in the series, The Quick and the Thread quickly introduces Miss Marcy Singer and the new embroidery shop that she’s just opened in Tallulah Falls, Oregon. Marcy’s also a brand new resident of Tallulah Falls, having moved there from San Francisco when her best friend suggested she open the embroidery shop. Luckily for Marcy, her new shop (The Seven-Year Stitch), is right next to Sadie’s coffee shop, so Marcy has ready made friendship and support when things start to go awry the night after the shop’s Grand Opening party. Marcy comes into the shop that morning to find one of the party-goes dead in the storeroom, having scratched a mysterious and incomplete message into the storeroom wall with a tapestry needle before succumbing to his death. Shortly thereafter another man is found dead, but this time foul play is immediately evident. It seems like everything is linked together through a fraudulent financial scam that had occurred several years previously. Four men are in jail, but now it seems as if a secret and silent partner is now cleaning up what he believes to be loose ends. Marcy quickly gets wrapped up in the ongoing investigation, both as a victim and as a sleuth. She starts to piece together the various players and scandals from the white-collar crime, ending up in a precarious and dangerous situation. Well-written cozy mysteries are some of my favorite stories to read and this combination of a cozy-mystery and the setting of an embroidery shop means that I might have a new favorite series! The author has made this a fairly believable story with characters that you want to get to know and love. Marcy Singer is a strong independent woman, who’s making her own way in the world and taking a leap of faith by opening her embroidery shop. Her detective skills are a bonus factor and it was a delight to watch her work everything out over the course of the novel. She has a great sense of humor and is a hard worker who values things being done right, yet creatively. Her shop is one that I’d love to sit in for a few hours, stitching away and chatting delightedly.